The Printronix P5000 has been discontinued. No direct replacement is available. Make an impact with the industry standard in line matrix. With line matrix printing up to 2000 lines per minute, the P5000 meets all of your line printing needs faster then ever before. 2000 line per minute printing, serial and parallel interfaces, cabinet & paper tray. 1500 line per minute printing, serial and parallel interfaces, open pedestal & paper tray. 1500 line per minute printing, serial and parallel interfaces, cabinet & paper tray. 1000 line per minute printing, serial and parallel interfaces, open pedestal & paper tray. 1000 line per minute printing, serial and parallel interfaces, cabinet & paper tray. 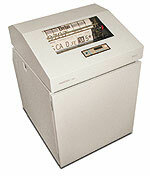 500 line per minute printing, serial and parallel interfaces, open pedestal & paper tray. 500 line per minute printing, serial and parallel interfaces, cabinet & paper tray.